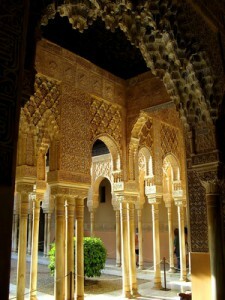 The Alhambra in Granada Spain is so much more than architecture and history, it is an overwhelming feeling. From the moment you start climbing the small hill which leads us to what I would like the gates to heaven or to our final resting place to look like, our bodies are invaded with new feelings and emotions. It is probable that many of us who are interested in the Alhambra, have seen beautiful pictures of it, but when you are coming closer, the magnificence of its physical aspect seeming to touch the deep Grenadine sky together with originality is breathtaking. Every day since its beginning as a castle in the 9th century, the Alhambra has lived memorable moments, both historic and passionate ones, and these sensations lived years ago are the ones which reach our most inner soul, causing us to tingling, trembling and even flurry. After having been built in the 9th century by the Zyridian rulers and later into a fortress in the 11th century, the Nasrid King Ibn al-Ahmar reconstructed what had been left, adding outer walls and innumerous towers, being completed in 1238. It might be that having come from a very arid country, Nasrid was obsessed with the idea of water and vegetation. He had water installations made, using a special system of bringing water from the nearby Darro River. There were fountains and reflecting pools and an air of freshness by surrounding the grounds with all kinds of greenery. The main entrance is through the Gate of the Granadas, covered by three arches from 1536 which were added by King Carlos V. There are three different routes that you can take, but going to the left and heading towards the Gate of Justice will take you to the Alcazaba Fortress. The Alcazaba fortress has a majestic Watchtower which told the people of the irrigation timing for their plots. 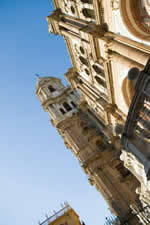 Inside, is the courtyard called the Plaza de Armas. 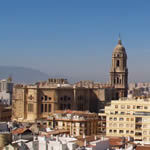 On the lower part of the red hill, are the Nasrid Palaces, made up of three main structures or wings: the Mexuar, which was used as the Town Hall and from where the administrative and judicial decision came from. Ithin this hall, there was a special altar called the Mihrab, facing the Mecca. Between the Mexuar and the Serrallo is the Golden Room courtyard. 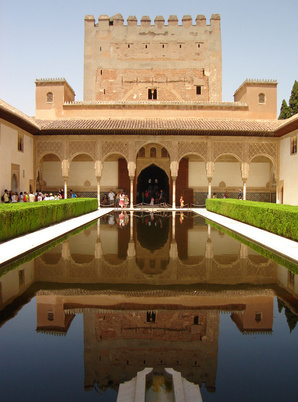 The Serrallo Palace, which was the residence of the sultans, made to the liking of Yusuf I, opens out onto the Patio of the Myrtles with its mirror effect pool, carefully designed so that the entrance of the water flows placidly so as not to break the reflection. From here e can see Arabic poems written into the plaster walls and the Hall of Boat ith its intricate wooden ceiling. All through our visit we are wrapped up in silence, only interrupted by the personal vibs and secrets being whispered by those who left them there. The Courtyard of the Lions is for many, the height of their visit to the Alhambra. There are 142 marble columns decorated with palm trees and a poem written around the fountain which cries out its need and desire to feel and hear water nearby. The Hall of the Kings is one of the most mysterious ones thanks to the effects that the shades, dim lights and archways produce together with the concave geometric prism-like figures all around. In this hall we can appreciate paintings which show us a contradiction in the beliefs of the Koran of not allowing human figures to be depicted. The private quarters of the sultan in the Hall of Two Sisters offers an incredible balcony view. The last part of the Alcazaba is the Harem, where only servants and family members were allowed to be. A little further on we come across the Royal Baths, which impressed the Christians not only for its impressive tile decoration but because the Christians has a different concept of the Arab hygiene. On your way through the Partal Gardens, richly populated with refreshing vegetation, always making us conscious of the Arab beliefs about connecting the paradise with the purifying and life giving water, we arrive at the Generalife; summer home of the Nasrid Kings. And one might ask, “ why did they make their summer home so close to their regular residence”? The answer is simple, even though Granada established its independence in 1238, the Moors survived because they paid tribute to King Fernando III. Granada kept its independence for over two centuries but were always worried about their security and therefore stayed within their citadel, the Alhambra.